George Mahuku giving a seminar presentation. This was said by George Mahuku, a plant pathologist at IITA-Tanzania, while giving an overview of IITA’s efforts to tackle pests and diseases during his contract review seminar at IITA-Tanzania, at the end of 2017. According to Mahuku, insufficient investment in resources to stop epidemics, delayed diagnostics, lack of proper channels to recognize major disease outbreaks, limited surveys to assess the extent of damage, and poor adoption of control technologies are some of the reasons that led to failure to control new pest and disease outbreaks in many countries in sub-Saharan Africa. He added that partnership and coordination among stakeholders was also important to effectively manage disease outbreaks. So was having a good strategy in place and the financial resources to implement it. 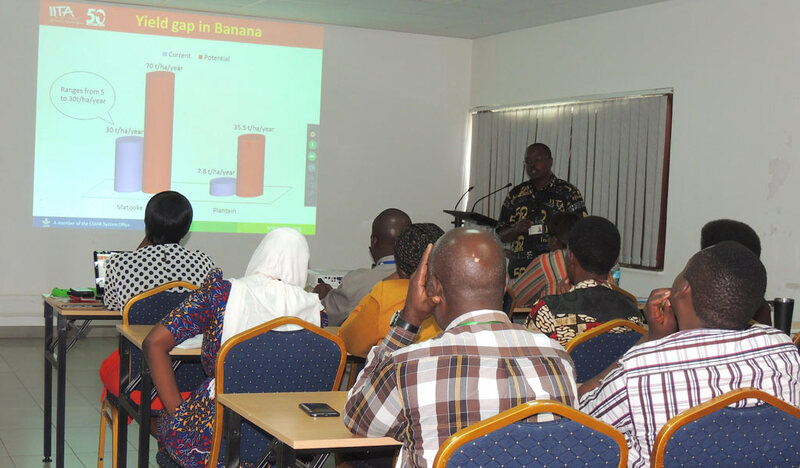 Mahuku noted IITA has been at the forefront of efforts to control new outbreaks of pests and diseases in important food crops such as maize, banana, and soybean in the continent to reduce their impact on food security and the livelihoods of smallholder farmers. For banana, an important food and income crop for millions of smallholder farmers, IITA has been tackling Banana Bacterial Wilt (XW), Banana Bunchy top, Banana Sigatoka, and more recently, Banana Fusarium wilt (Foc TR4), which was discovered in Africa for the first time in Nampula, Mozambique. The disease was reported in Nampula in 2013 on a commercial farm of 1,200 ha planted with a Cavendish type banana. Since then, more than a million plants equivalent to over US$30 million have been lost. In addition, 50,000 smallholder banana farmers in Nampula are reported to be at risk and 100 million more if the disease escapes from Mozambique, potentially leading to over US$4.3 billion losses in food security and banana biodiversity. According to Mahuku, much effort is under way to contain the disease in the two commercial farms. Awareness creation has been taking place and appropriate protocols such as rapid screening of germplasm to expedite the breeding of resistant banana are being developed. A good strategy to contain pest and disease outbreaks should include prevention activities such as surveillance, early detection, and taking immediate measures to stop further spread. Deployment and dissemination of appropriate technologies and tools such as diagnostic tools for rapid identification of pests and diseases and integrated pest management options, development of improved, resistant varieties, and upscaling of quality seed production technologies are also needed. The strategy should also include creating awareness and networking for surveillance and building both human and infrastructural capacity.